The Belle Isle Nature Zoo’s backyard is undergoing a transformation from au naturel to a natural playground area. While we believe it’s beneficial for our native flora and fauna to have natural places to grow wild and free, we also believe the same is true for local children! What began as an ordinary space with a lot of potential is becoming an extraordinary space with a lot of possibilities for families to stay and play. 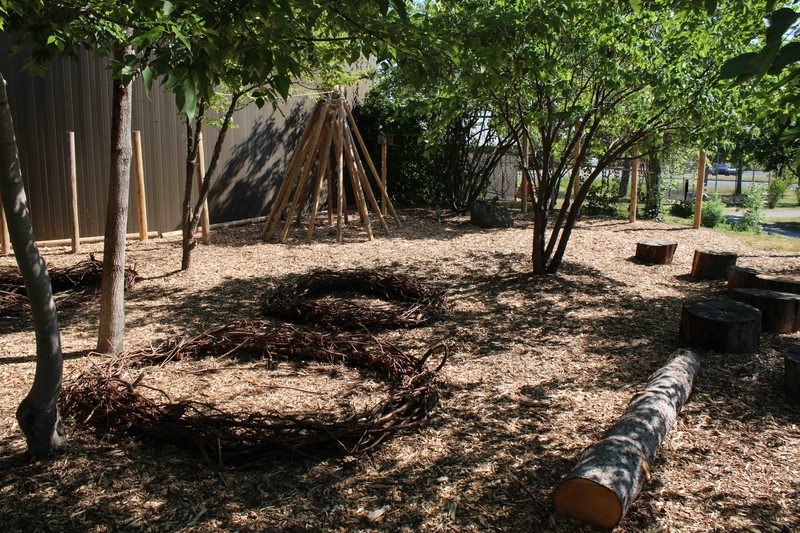 While the playground environment remains filled with natural materials, the area now provides an inviting opportunity for children to exercise their imaginations, develop a sense of exploration, and enjoy some physical activity outside. Physical, mental and social health benefits flourish as a result of time spent outdoors, and we are working on designing a space that will sustain and support our guests as well as our environment. Loose items made from natural materials inspire creative play – a balance beam from a fallen log offers a challenge of skill and concentration of gross motor skills, and a trail of tree stumps is just right for hopping, skipping, or even to be rested upon by visitors of all ages. People-sized nests are constructed and stocked with nature’s toys: sand, pebbles, stones, and “tree cookies”, which are slices of tree branches just perfect for construction play. A wooden teepee stands tall, waiting for hide-and-seekers, pretend campouts and all the creative games our small guests with big imaginations may bring. Sensory activities are also in the works: Natural looms will build fine motor skills with a chance to use plant material to weave designs. Bamboo chimes and natural drums will inspire our natural musicians to play to the rhythm of the seasons, and colorful textural elements will reflect the beautiful palette of the natural world. As the occasional chipmunk scampers through the playground and the birds call out their daily activities, they are at home in the natural environment (we’ve left plenty of natural “wild” spaces for our non-human animal friends around here!). Our goal with this playground is to create an opportunity for children to cultivate a sense of comfort and connection in outdoor experiences. Playing outside in nature – with nature – can help children gain respect for their environment and better understand their own place in it. And while the natural play supports the development and strength of our children, the sense of ownership they develop stands to strengthen the future stewardship of our natural world, which is vital to the health and sustainability of our planet. 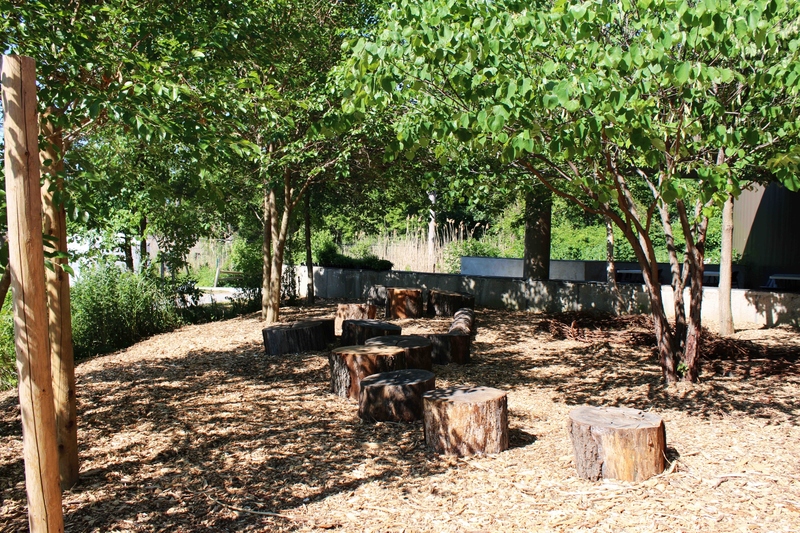 We invite you to visit the Belle Isle Nature Zoo to check out our natural playground work-in-progress, hop on some logs, feel the textures and hear the sounds of nature. Tell us what you think! – Amy Greene is a curator of education for the Detroit Zoological Society and oversees the Belle Isle Nature Zoo.